All of these bookmarklets/favelets will be useful to all web designers and developers, they are the quickest method for testing, analyzing and tweaking any web page. A Bookmarklet or Favelet is a small application tool, stored as the URL of a bookmark in a web browser or as a hyperlink on a web page. Description: This bookmarklet simply applies a layout grid image to the body of a page. Description: This bookmarklet creates a div, positions it absolutely and then applies the background image to the div. Description: MRI is a free cross browser tool that lets you test selectors with any web page. Compatabile Browser(s) : Safari, Firefox, Netscape, Opera and Internet Explorer 7. Grid – overlays a highly configurable layout grid over a web-page. Grid can be set to match any set of dimensions, allowing easy development of CSS layouts in the web-browser. Rule – displays rulers on a page, with all the expected features of the rulers found in a desktop design application, including guides which snap to block display elements and origin location control. Unit – allows measurements to be made between any two points on a web-page, giving basic information about each of the points clicked on, and drawing a line on the page for the measurement. Crosshair – draws a crosshair cursor on the page to assist in layout alignment. Cursor information is also presented in a tooltip. Description: It highlights definite issues with your page, warns about possible issues and also highlights areas on the page that might benefit you. Description: Reload CSS refreshes only the CSS of a loaded page every 2 seconds so you can use your CSS editor of choice and see semi-real-time changes in your browser when you save. Compatabile Browser(s) : Safari, Firefox, Netscape, Opera and Internet Explorer 6+. Description: DOMI allows you to view and manipulate the DOM of a web page simply by mousing around the document. Compatabile Browser(s) : Safari, Firefox and Internet Explorer 6+. Description: WAVE is a free web accessibility evaluation tool, rather than providing a complex technical report, WAVE shows the original web page with embedded icons and indicators that reveal the accessibility information within your page. 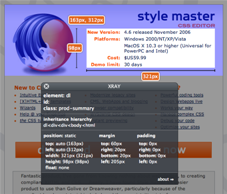 Description: XRAY is a cross browser tool that lets you see the box model in action for any element, letting you see beneath the skin of any web page.